Trekking in Nepal was started from Annapurna region about five decade ago. The trekking was introduced by ex Gurkha colonel Jimmy Roberts. While trekking was introduced we had to travel with full of equipment. Such as lodging (tents), foods and all kitchen utensils with plenty of manpower together. These days most of the trekking route has basic hotels. We can trek hotel to hotel and they are able to supply all the basic need for trekkers. Some places along the route we can get some modern amenities too. Annapurna Circuit Trek is one of the most popular and famous trekking route of Nepal. Only one trekking route in Nepal to enjoy the mountain ranges from four different directions. Panoramic sceneries of Himalayas, including of the Mt. Dhaulagiri (8167m), Mt. Annapurna I (8091m) Mt. Manaslu (8156 m), Mt. Annapurna II (7937 m.), Mt. Annapurna III (7555m), Mt. Annapurna IV (7525m), Mt. Annapurna south (7219m), Mt. Nilgiri (7041m), Mt. Fishtail also called Mt. Machhapuchhare (6993m), Mt. Hiunchuli (6441m), Mt. Lamjung Himal (6986m), Tukuche peak (6920m), and Tilicho peak (7145m). Furthermore, there are the settlements of diverse communities such as the Brahmin, Chhetri, Thakali, Magars, Tamang, and Gurung. Also, it is a trail rich in wild animals such as Mountain Thaar/ Goat, Leopards, Jackal, birds such as pheasant, long-tail birds among others.We start this trek form 760m we can reach up to 5416 m gradually. We can enjoy dense village on the starting and ending point. Whereas cultivated field terraces to tropical bushes. This area has easy access for trekking. 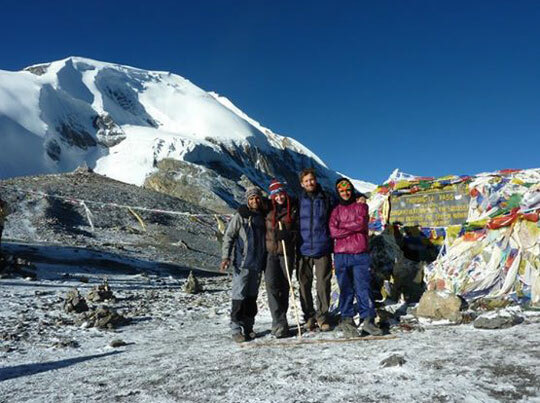 Annapurna circuit trek is the most popular trekking because of its b diversities. The circuit takes one around the Annapurna Himal, following the courses of two mighty rivers-- Marsyangdi in the east and the Kaligandaki in the west. Kaligandaki is the world's deepest gorge, flanked by the giant Dhaulagiri and Annapurna Himalaya range. The flora, geography and culture also change dramatically around the Annapurna circuit trek. Drive Kathmandu to Besisahar (790 m) will be approx 7 hrs. scenic drive by bus whilst if you are taking private transport you may save about one and half hour. Overnight at lodge on full board. This day our journey starts from Besishahar. We just walk along the road to Khudi at 790 m, we then reach the first Gurung village. As we continue the trek from Khudi the trail offers fine views of Himalchuli and peak 29 (Ngadi Chuli). Still follow the road to Bhulbhule at the 825 m, it then goes to Ngadi before reaching Lampata at 1135 m and climb up to Bahundanda at 1310 m. Overnight at lodge on full board. Today the trail drops steeply to Syange through Ghermu from Bahundanda. We will cross the Marsyangdi river on a suspension bridge to get Syange. We then follow the rivet to the stone village of Jagat before climbing through to Chyamche at 1400m. Overnight at lodge on full board. The day begins with the rocky trail following the Marsynagdi River steadily uphill to Tal at 1675m. We enter into Manang district today. Tal is the first village of the Manang district. It will be nice walk crossing a wide flat valley of Tal village. The trail then climbs a stone stairway to 1860m till another stairway. The journey continues making up and down to Dharapani at 1890m. There we find a stone entrance Chorten, Mani walls, prayer wheels they are typical of the Tibetan influenced villages from here northwards. We then visit the Bagarchhap at 2160m. The people and their living style will be quite different than previous days. Overnight at lodge on full board. With often rock and rocky, the trail climbs to Timang at 2760m and then continues through forest with breathtaking view of Himalchuli and Manaslu mountain range. The trail will be little bit gradual from Timang to lunch place and further more. We will stop at Thanchok for lunch and continue to Chame after lunch. Chame is the headquarter of the Manang district. We can see beautiful views of mountains from here. Overnight at lodge on full board. Today we starts through pine and birch forest and steep narrow valley. We will walk through Talekhu and Bhratang and cross a river on a long bridge. We then walk uphill to Dhikur pokhari through beautiful pine forest. From there the view of the soaring Kuntu Danda Sworgadwari (heaven's gate) will be just amazing. Afterlunch we will cross small bridge over Marsyangdi river to climb to upper Pisang. Overnight at lodge on full board. This day we start the trek through pine forest gradually inclined for about one and half hour up to small stream. After crossing the suspension bridge over the stream we will climb up to Gheru at the elevation of 3670 m. We will make small break to enjoy the view of Annapurna mountain ranges. Now the trail comes up and down through alpine pine forest until reaches at Nawal. Which is the ancient fort of Ghale Kingdom. Overnight at lodge on full board. Today we continue through the drier upper part of the Manang district, cut off from the full effect of the monsoon by the Annapurna range. People of this region, herd Yaks and raise crops for part of the year besides, they also continue to enjoy special trading rights gained way back in 1784. Leaving Nawal, will be descending trail through the Marsyangdi valley meet up the lower trail at Mungji. The southern route by Hongde, with its airstrip, at 3325m involves less climbing than the northern route via Gheru, through there are better views on the trail that follows the northern bank of the river. From Mungji, the trail continues past the picturesque but partially hidden village of Braga at 3475m to nearby Manang at 3500m. Overnight at lodge on full board. Day 11: Manang- rest for acclimatization. Visit the surroundings. Today we spend a day acclimatizing in Manang. The whole day we spend by doing some fine day walks and over viewing the magnificent views around the village and the day time is best to gain altitude. At the end of the day, we return back to our lodge and have night rest. Overnight at lodge on full board. This day we leave Manang and the trail makes as ascent of nearly 2000m to the Throng- La (pass). We make the climb steadily through Tenki Manang, leaving the Marsyangdi valley. Continuing along the Jarsang Khola valley we reach Ledar at 4250m, there we see the vegetation steadily more sparse. Overnight at lodge on full board. The trail descends to cross the river at 4310 m we then climb up to Phedi at 4420 m. At high camp on the elevation of 4850 m, we can recently found some good guest house built. Overnight at lodge on full board. The journey from the Phedi "foot of the hill" or at the foot to the 5416 m Thorung-La (pass), begins the day. We then make the climb steeply that is regularly used and easy to follow. However, the problem may arise due to the altitude and snow. It often causes terrible problem to cross the pass if it is covered by snow. About four hours climb to the pass marked by the piles of stones and prayer flags. As you reach the top you are rewarded by the magnificent view from the top. We will enter in Mustang district after the pass. Long way down to Phedi and Muktinath from the top. Overnight at lodge on full board. After crossing high pass of 5416 m now we are stepping down to lower elevations. Your muscle may feel pain full and we are taking ways down to Kagbeni for the first day which is the boarder of Upper Mustang and Lower Mustang. Overnight at lodge on full board. It will be nice walk through Kali gandaki valley also known as a windy valley. It will be easy walk then before but you might not like the strong wind after 12 o'clock. This place is also nice settlement of more than 100 houses of Thakali people. It has also 2 monasteries and some apple brandy factories. Overnight at lodge on full board. Even today our trail follows the bank of Kaligandaki river almost inclined down to Ghasa and it may takes approx 6 hrs of walking. The views of the stunning mountains will be just great. You can see Dhaulagiri, Niligiri, Tukuche peak, Annapurna I and many more mountains. Overnight at lodge on full board. The trail will be mostly down and gradual this day. We will leave Mustang district today. Walking through Rukche Chhahara and Dana will be the highlights of the day. Today will be special for you because you can enjoy the natural hot spring. 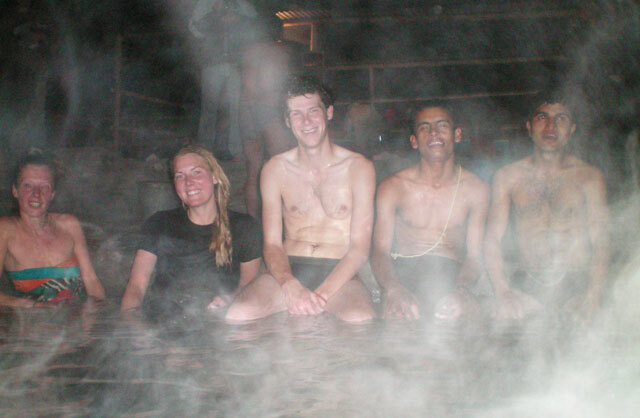 This is the place to be fresh up with hot water during the entire tired days of long trekking. Overnight at lodge on full board. Today we will meet our goal after a long up hill from 1167m to catch up with 2855m and also the final day of the up hill as well. It will be approx 7-8 hrs to reach the the Ghorepani. You will enjoy all the Annapurna and Dhaulagiri mountain ranges from here. Overnight at lodge on full board. This morning we start our trek early in the morning to enjoy the sunrise over Annapurna and Dhaulagiri ranges from the top of Poonhill 3210 m, at the range of 270 degree. After enjoying the all major peaks from Poonhill we will be back to lodge for breakfast and we continue our trek to Tadapani through the rhododendron forest enjoying exotic wildlife and birds. Overnight at lodge on full board. Today will be the second last day to get city life. You will be exited to get to Pokhara after 2 weeks of trekking, it takes about 3 and half hours to get Ghandruk from Tadapani, we will reach here by lunch time and after lunch we will visit Gurung Museums "Local and ancient things". This is one of richest village on sanitation with full knowledge and awareness and also know as Eco Trekking area. Overnight at lodge on full board. Today we will walk to Nayapul crossing different villages like Kyule, Syauli and Birethanti in about 4 hours of walking. We will have our final lunch in mountain at Birethanti. We will continue our walk to Nayapul about 4o minutes and drive to Pokhara. Overnight at hotel on B/B. Day 24: Final departure to Kathmandu airport or further program according to your flight schedule.